The President of the African Development Bank (AfDB), Akinwumi Adesina, has commended IITA for piloting a sustainable program that is already combining the energies of youth in ventures that could make the continent food sufficient. The President also expressed hope that the creation of young farmers will help stop the continent’s dependence on imported food. 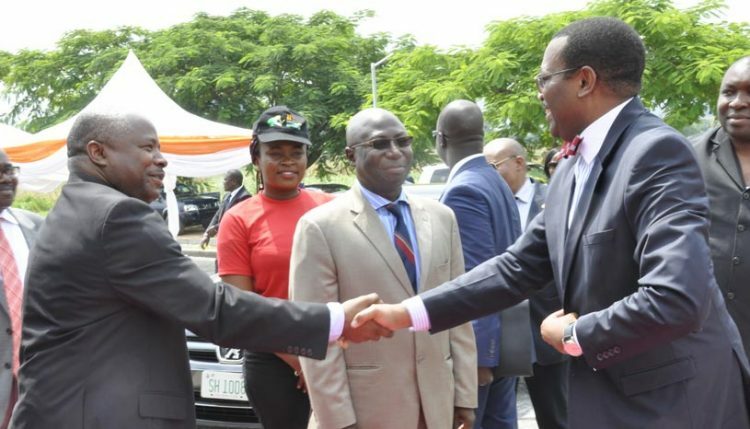 DG Nteranya Sanginga welcomes AfDB President Akinwumi Adesina at the IITA Abuja Station. The President made the statement on 27 September when he visited the IITA Station in Abuja with principal officers of the Bank. He was in Abuja to hear the success stories of the IITA Youth Agripreneurs (IYA) in Nigeria and to also inspect the construction of the youth training center funded by the Bank at the station. Commending DG Nteranya Sanginga for initiating an Africa-wide youth-in-agribusiness program, Adesina said that only visionary leaders like DG Sanginga could make young men and women billionaires from agribusiness. “Sanginga is doing something remarkable at IITA. He is pragmatic, practical, and result driven, trying always to link results to research and development. The success of the IITA Youth Agripreneurs today is a result of his vision. Listening to IYA has convinced me that Africa has truly embraced agriculture as a business and you (IYA) are the icons of agribusiness today and will be the millionaires and billionaires from agriculture tomorrow,” Adesina stated. President Adesina also pledged the support of the Bank towards funding independent businesses for the Agripreneurs and also ensuring that they succeed in Nigeria. He disclosed that the bank had already approved a US$300 million fund for the implementation of the ENABLE Youth project through which IITA, working with the Federal Ministry of Agriculture, will create 37,000 direct jobs in Nigeria. The Bank is also in the process of empowering financial institutions with the funds to support young Agripreneurs. “To support Nigerian youth, the Bank has launched ENABLE Youth and is delighted to implement the project with IITA and the Federal Ministry of Agriculture in Nigeria. The focus is to directly support 37,000 businesses and each one having 35 people under them can create about 180,000 jobs…this will greatly reduce unemployment prevalent in Nigeria today. The Bank will also provide finance for youth beneficiaries to run their businesses, set up a business incubation support and access to finance for young people, and enable financial institutions so that young people can access the funds that they need to grow their businesses,” he said. Agripreneurs from the various Nigeria locations and guests from AfDB and partners based in Abuja listen to AfDB President Akinwumi Adesina’s talk. Going forward, Adesina will be con­cluding discussions on the implementation of the ENABLE project in Nigeria so that the initiative can start as soon as possible.